There is nothing more important you can do as a Democrat living abroad than to vote in our Global Presidential Primary and to get as many others to do the same. The more votes we can register, the more strength Democrats Abroad can display, which in turn may lead to more support for our important efforts in the future. 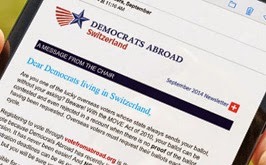 Make sure you are a member in good standing of Democrats Abroad by January 31, 2016. You would still be able to join Democrats Abroad up to the date you vote in our Global Presidential Primary if you wish to participate in the same. Our Global Presidential Primary will take place between March 1 and 8, 2016.
have not voted yet in this election cycle's Democrats Abroad Global Presidential Primary. You will be able to vote in-person and by mail, fax, or email. No proxy voting is allowed in the Global Presidential Primary. If you want to vote by mail, request your ballot between January 11 and February 8, 2016 and mail it to your Country Committee Chair by March 8, 2016 (Country Committee chairs must receive vote-by-mail ballots by March 13, 2016). You can also mail the ballot directly to our International Chair as long as she receives it no later than March 19, 2016. The blank ballots will also be posted to DemocratsAbroad.org by January 11, 2016 for later download. By January 10, 2016, our International ExCom will set up and announce a virtual fax number to which completed ballots may be sent for those who would prefer to fax over the other delivery options. Please look at our website then to learn the number. You can email your ballot from 00:00 hours CET on March 1, 2016 so long as it is received no later than 24:00 hours CET on March 8, 2016 to: PrimaryVoting@democratsabroad.org. To be clear, voting by email means filling out a printed ballot and then scanning or photographing the ballot and sending the graphics file as an attachment to: PrimaryVoting@democratsabroad.org. It behooves each of our three Regions to get out the vote because the actual number of At-Large Delegates to be selected through our Regional Caucuses will depend on the democratic strength (i.e., the number of votes) cast in each Region. So vote and get others to vote!